This creamy and savory recipe for warm spinach dip isn’t only a delicious dish to gather around during the holidays, it is kid-friendly in several ways. 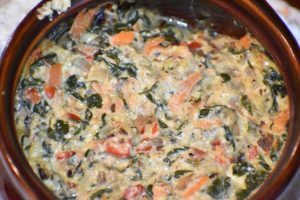 Though it is chock full of vegetables, it has plenty of cheese and baking it takes some of the crunch out of the traditional cold spinach dip, making it more friendly to young palates. 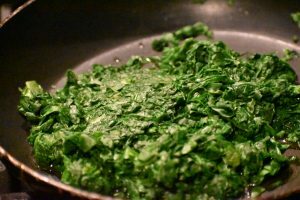 It goes great with any bread or rolls you have at the Thanksgiving table, or any cracker in your cupboard. While not all children raise their hands at the sight of spinach, I find when you take off the spinach stems and chop it finely before wilting, it is more kid-friendly to chew and children come back for more if you can get them to take the first bite. And if they don’t? More for the adults! Feel free to substitute the cheese with what you have on hand. Make it night or two advance of your holiday dinner or party, just bake before serving. Tip: If you let the little ones add the ingredients and stir they will feel more inclined to taste their creation. Start by prepping the vegetables and cheese. 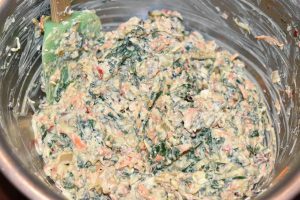 If they are able and willing, have the kids take the stems of the spinach, shred the carrot and shred the cheese, it’ll save you time! 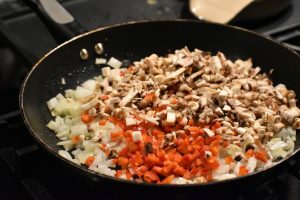 In a saute pan on medium heat, warm the olive oil and cook the onion, peppers and mushroom until the onions are translucent and the mushrooms have shrunk, about 8 minutes. Add the minced garlic and a splash of soy sauce and cook until aromatic, about 4 minutes. 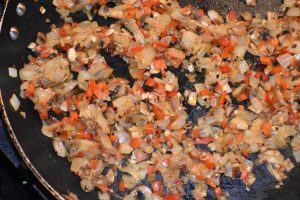 Take off the heat and season with garlic salt and pepper to taste. Set the mixture aside in a mixing bowl. Toast the nuts in the same pan with a sprinkle of garlic salt on medium-low heat, stirring consistently for about 5 minutes. Empty the pan into the mixing bowl with the onion mixture. 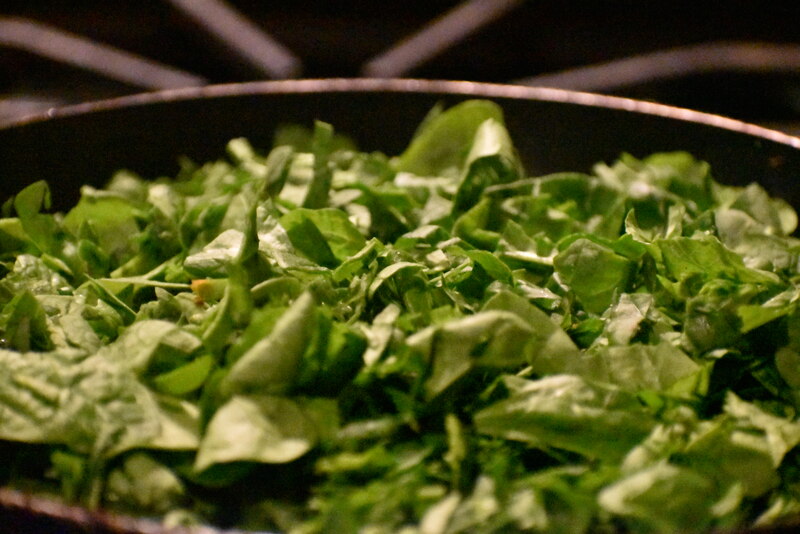 Keep the heat in the pan low and cook the fresh spinach until wilted, stirring consistently for about 5 to 7 minutes. 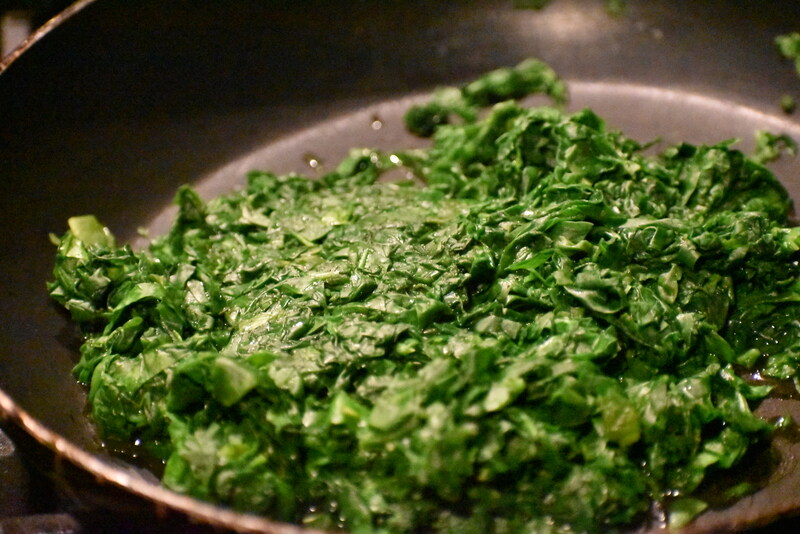 Press the cooked spinach in a fine-mesh strainer with a rubber spatula to release all of the water. Add to the mixing bowl, along with the shredded carrot and mustard. Microwave the cheeses for 30 to 40 seconds to soften and then mix with the other ingredients. Stir the mixture until it is well combined and the mozzarella isn’t stringy. Add the sour cream and stir until consistent. If you have left over shredded cheese, sprinkle some on top and bake in the oven at 375 degrees, covered with foil for 30 minutes. Enjoy!